PETALING JAYA: Almost a decade after it was first ordered, the world’s largest and fuel-efficient A380 aircraft finally landed on Malaysian soil at 3.35pm yesterday. It was a major advancement in air travel for Malaysia Airlines (MAS) as it joined the elite A380 club. The 73m-long technological wonder can carry up to 494 passengers and offers one of the best seating arrangements in the industry for its first-class cabin, where the seats are as big as a single bed, measuring 40 inches by 87 inches. It will take to the skies for commercial flights on July 1 on the much lucrative KL-London-KL route with daily frequency. A second A380 will be added by August as the second delivery is expected in July. In 2003, MAS ordered six A380 and the first delivery was supposed to be in 2007 but it had to endure a five-year delay by the aircraft manufacturer. 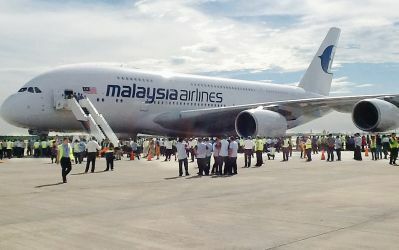 On board the A380 were MAS top brass, comprising group CEO Ah­­mad Jauhari Yahya and a technical team. After the handing over ceremony in Toulouse on Tuesday, the flight took off at about 8pm (French time) to KLIA. Soon after its arrival, the aircraft was moved to Hangar 6 for some final touches. The aircraft is slated to return to Toulouse on June 6 for some additional touches. Ahmad Jauhari added: “It is a new beginning as far as uplifting of ser­vices and product level is concerned. MAS is the eighth carrier to take delivery of the A380 aircraft.